innovation” in Ornit's products family. Innovation has made Ornit the well-known fastener-solution contributor that it is today. At Ornit, creativity is a way of life. In addition to R&D, innovations come from personal throughout the company. Starting from personal at our production lines who strive to improve productivity, via engineering and quality control personal who assure top quality products, to our application specialists who work closely with our customers to deliver the unique designs. We want to be your partners. Register to our newsletter and receive professional information, be the first to hear about special offers and new products. Our Industrial Fasteners Division offers over a century of experience in creating innovative fastener products and solutions serving the commercial transportation, automotive, industrial, technology, construction, and energy markets. Our fasteners and installation tools are used to assemble everything from trucks and truck trailers, buses, railcars, and automobiles to HVAC equipment, satellite dishes, solar panels, electronic cabinetry and shopping carts. Our extensive product line includes blind rivets, blind bolts, lockbolts, plus a full line of pneudraulic and hydraulic tools and installation equipment. TITGEMEYER Group is one of the leading fastening technology and vehicle component companies around the world. Some 500 qualified employees develop, produce and sell carefully-tested products and branch-specific solutions for trade and industry. Safety, cost-effectiveness and environmental compatibility – the TITGEMEYER name has been synonymous with these for over 110 years. Our fastening technology products include blind rivets, threaded inserts and assembly systems, as well as sealants and adhesives, plus state-of-the art matching installation tools. Profast Australia are your specialist partners when it comes to providing the very best in fastening products. Our product range primarily consists of specialist rivets, rivet derivatives, two-piece fasteners, threaded inserts and the associated installation tooling. We present our customers with a range of solutions using only the highest quality parts. One of our main points of difference is that we distribute these products as an independent broker rather than as a proprietary distributor. Crest Fasteners has been dedicated to bringing its customers all the bolt, nut, and fastener supplies they need. By reducing collateral procurement costs, we are able to offer customers quality products at a fair price no matter what. Although we are now a large fastener company with an international presence, we are still dedicated to all of our customers big and small. Our knowledgeable staff will save you time and energy by finding the right solution for your project, and our globally integrated supply chains allow us to carry an extensive stock full of unique and hard-to-find items. Bay Fastening Systems is a full service distributor of engineered fastening systems that include blind rivets, pop rivets, drive rivets, solid & semi-tubular rivets, military spec rivets, lock bolts, inserts and specialized installation systems. Founded in 1962, Bay Fastening Systems has become a leader in the fasteners industry through its continuing commitment to quality service, deep product knowledge and consultation, and an easy ordering process. At Bay Supply, we have created one of the largest warehouse and inventory management systems in the industry to help serve your customers with instant order processing and tracking. It also comes complete with an expert technical support staff for tools and applications. Now instead of calling several distributors to get your products, you only have to call one. Fit - Lock Systems Ltd is a long established major stock list distributor and manufacturer of a wide range of industrial fastening systems and tools to complement them. Fit Lock Systems offer a safe and economical solution to many fastening problems. They can be installed where there is no access to the blind side of your application. Installation is fast, tooling costs are low, and this gives high operator productivity. technical fastening and assembly solutions, backed up by over 50 years’ experience in the following industrial sectors: electronics, computer and IT, data and telecoms, medical, automotive, railway and aerospace industries, household appliances and general manufacturing. Scell-it was formed in 1988 with the aim of offering "FIXING" solutions to the industry and to the Building trade, via a network of professional distributors. Scell-it is an independent family company whose average age is below 35 years. We develop innovative products for professional use. If you work in New Zealand and you are involved with the joining of materials by means of mechanical fasteners, then sooner or later you are bound to come across our company... Rivtec. Our story began in 1973 in which years the company was a distributor of conductive metals as well as fasteners, most of which were used in the fabrication of medium voltage switchgear, electrical enclosures and the like. How times have changed us - dedicated as we are now to special fasteners alone, their distribution, installation, support tooling and even in some instances, their fabrication. Always there for the end user, presenting fasteners, tooling and ideas that make engineering and economic sense... We think... Then we fasten! Founded in 1974 by Paul-Émile Lord and his wife Rolande Lapointe, PL Distribution was destined for success right from the beginning. Soon after the couple founded the company, their son Guy, then just 18, teamed up with them to expand the family business into the Saguenay-Lac-St-Jean, Abitibi, North Shore, Gaspé, Mauricie, and Eastern Townships regions. PR Distribution quickly made a name for itself as a distributor of automotive spare parts, selling mainly to car dealerships. The two men made a positive impression on their customers and soon built a solid reputation based on their philosophy of respecting customers and their needs and requirements. Their approach created a solid foundation on which to grow their company. The company is among the market leaders in fastening technology in Europe, the Americas and Asia-Pacific. Bossard is a global network of companies with more than 2,000 employees in over 70 locations and carefully selected international partners in all regions of the world.Our drive for excellence and innovation has led to steady growth and market success for more than 180 years. R & R Rivet and Fastener Products was founded in 1989 as a manufacturer of solid, shoulder and semi-tubular rivets. Since then, we have expanded our capabilities to produce specialty cold-headed parts for industrial and automotive markets using almost all type of materials. In 2000, we established a new company, Canadian Blind Rivet Corp. (CBRC). CBRC is a manufacturer of open-end blind rivets and specialty blind rivet applications, through hole parts and two-piece mate rivets. We are continuing to expand our capabilities and introducing new products to the market. 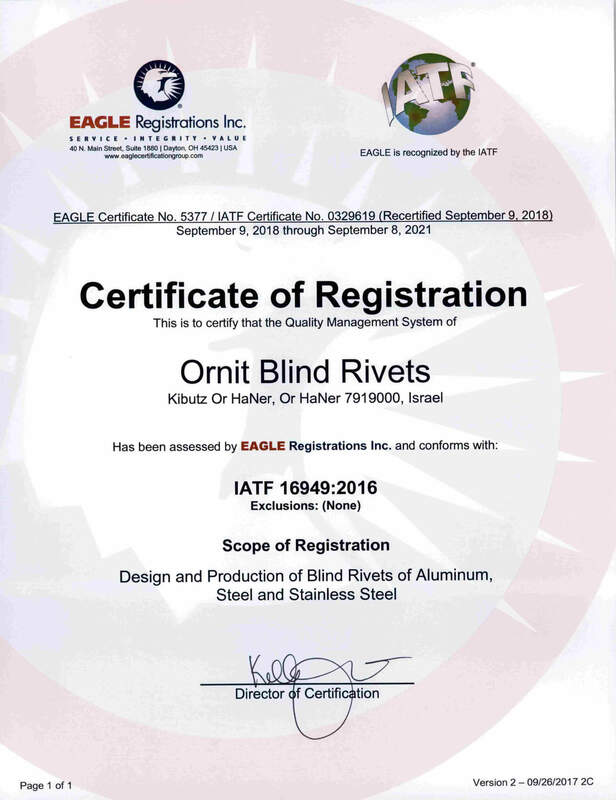 In order to provide better selection and services to our customers, we are offering a full line of structural blind products acting as exclusive distributor of Ornit Blind Rivets. Our import line also includes threaded inserts, lock bolts and other products.